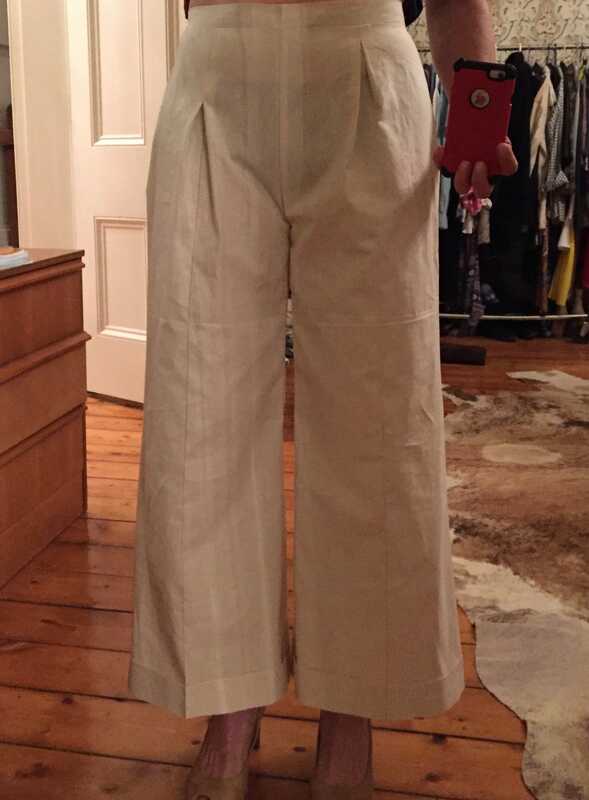 Recently I drafted my own very full legged pants from my block. This shape makes a regular appearance in my wardrobe, here are 2 pairs made from a Style Arc pattern many, many moons ago. This post is a dissertation on the relative merits of crotch point extension in my humble experience and why it’s done in full legged pants, complete with scientific analysis and photographs I tell ya! I have recently embraced photo compression technology and would really appreciate your honest feedback. Do faster loading times justify the loss of quality in these photographs or are they clear enough. Please, don’t hold back! Clothing choices for the past 5 years have been dictated by footwear – I shredded my right plantar fascia while running on a beach and words cannot describe the dull ache followed by shooting, stabby pains radiating up my leg after walking. All orthopods should have at least 1 bout of plantar fasciitis in their lives and may fleas infest the jock strap of the one I saw about my left foot wherein he remarked “oh, it’s just plantar fasciitis”, like it could be cured with a course of antibiotics. That one took 4 years to resolve, thanks for nothing Mr Orthopod. Thing is, it’s not really a heel height thing, it’s more of a stability issue and frankly I’ve worn sensible shoes all my life ‘cos I like to stride. She drops to her knees pleading to the Gods of footwear… please let me find a pair of shoes that feel like the sensible $350 German walking shoes but not $350. While you’re at it, can you make them fashionable and feminine cos those sheilas at mardi gras are giving me looks, maybe they just want my sensible shoes!! BTW, the converse in the photos below are killers, so hard underfoot – they kill me. 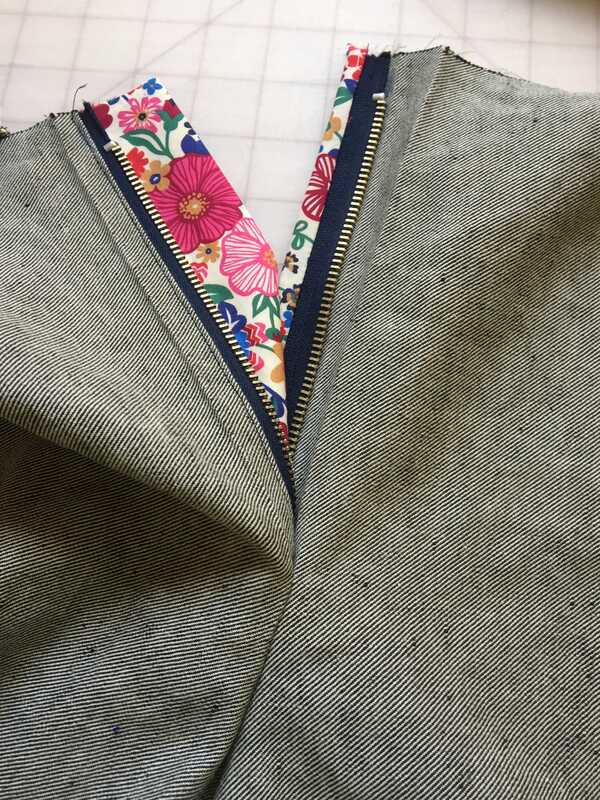 In her Craftsy class Designing Pants – Suzy suggested dropping and extending the crotch point for a loose pant, but as I am not one to trust anyone, I first tried leaving the toile crotch point as it was on my pant block. See (below) how the crotch just looks too tight accentuating the boof afforded by the pleats? It just looks weird doesn’t it? This crotch point was fine as a basic pant block with straight leg and no pleats. Kind of outlines the crotchal region in a rather unflattering way don’t you think? 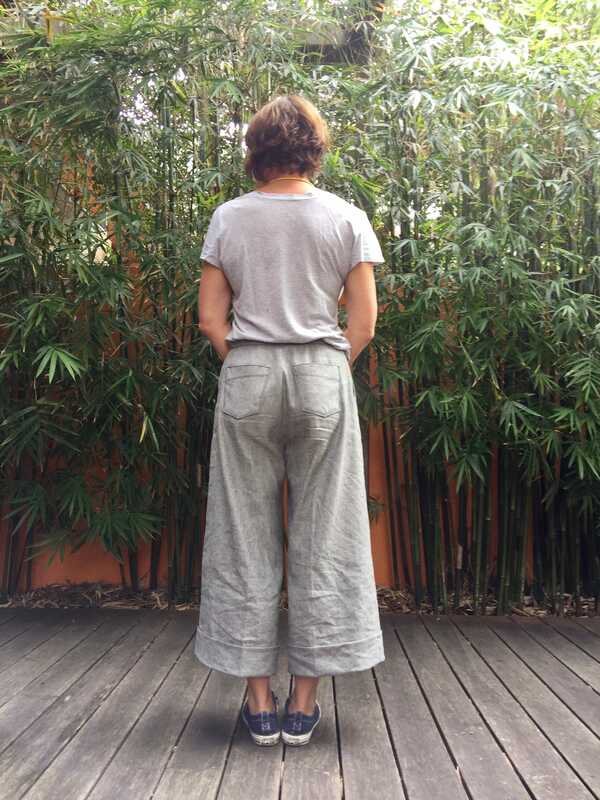 This pic (below) taken after lowering and extending the crotch point 1 cm each direction, it made a huge difference and now the pants just look ‘right’ somehow! The original block crotch point sat at about 1-2cm from ‘the body’. The extended point now sits at about 3-4cm below. 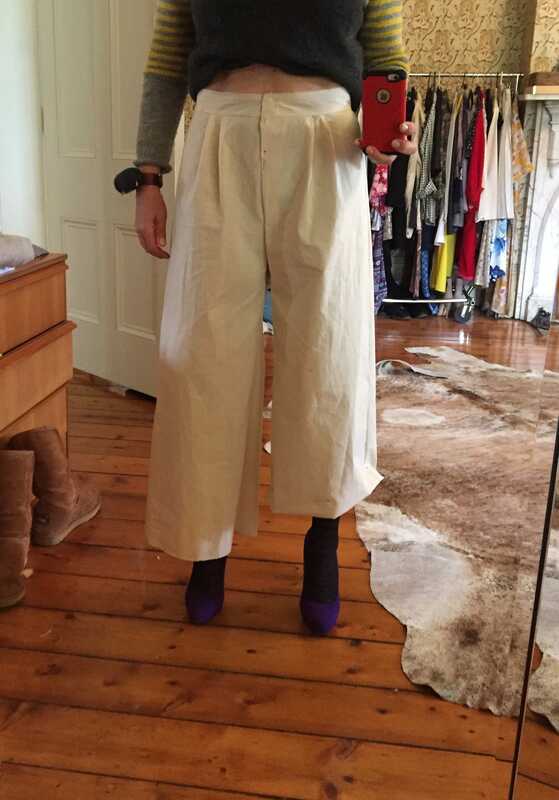 post alteration of crotch point and testing for hem length, pity Princess’ bedroom is so messy – soz! Adding 1cm each to the front and back extension, extends the total crotch curve a total of 2cm loosening it and allowing the fabric to sit away from the body. Obviously, if one’s block was a little loose fitting you could do this in reverse for a closer fitting pant. And the finished product from a scrap of remnant fabric of unknown origin! Apologies for the scrunched styling – these had been worn all day in 30C with maximum humidity, oy the humidity!! 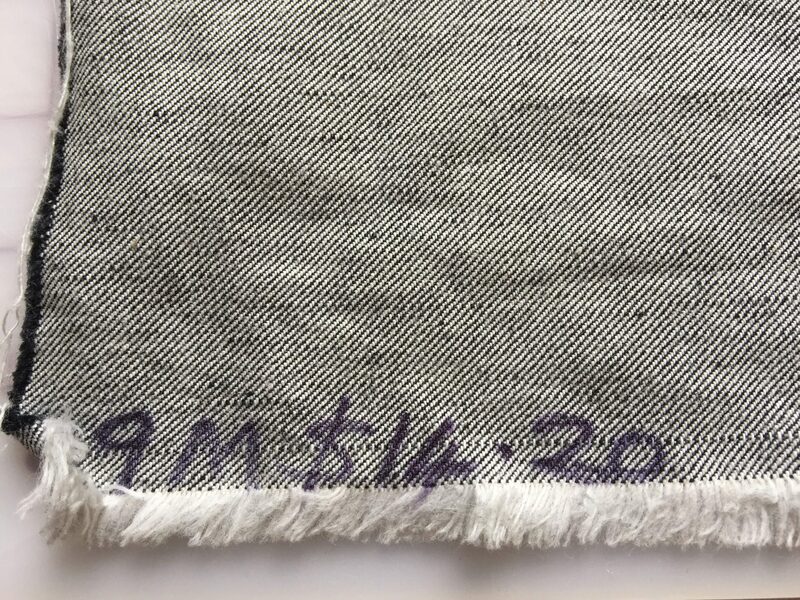 This denim definitely has some linen in addition to the cotton, its cool and drapes beautifully but crikey – those creases! 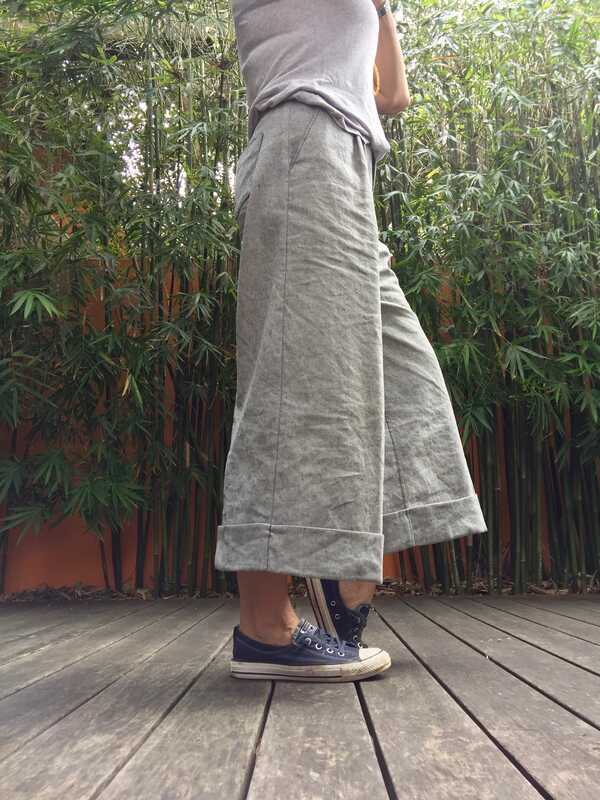 nice slit pockets and dirty converse but neat garden beds now! not so much room in the derriere with hands in pockets! Well, we’ve had quite an adventure this past month. Now all unpacked back into our home in Sydney after an excellent holiday in beeyootiful Canada. We watched an ice hockey game, the highlight of which was not driving more than an hour in each direction on snowy highways cos’ hubs forgot his license, nor was it the ‘game show’ atmosphere with giant bowling pins and pretty girls skidding on plastic discs to crash them down! The real highlight was the fella who sung the national anthem after having introduced new immigrants to the onlooking crowd to a rousing cheer. Families from Nepal, India and Mongolia were brought out onto the ice. Our little family appreciated the subtext. 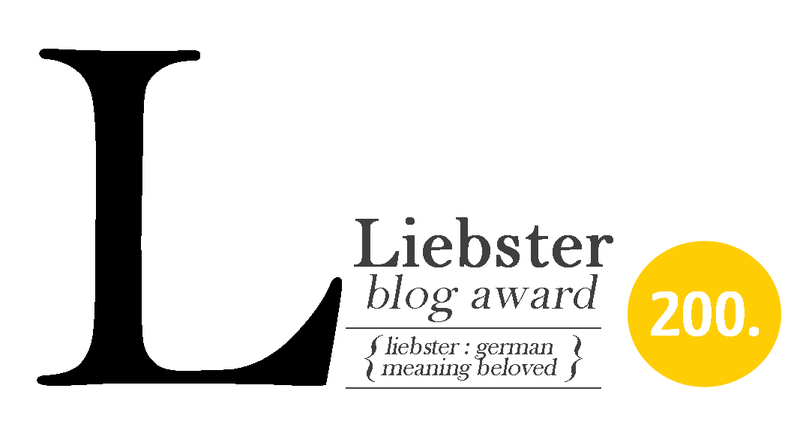 Not so much a “you must be just like us” kind of thing. But more a “welcome” and “isn’t this great, don’t you want to embrace our culture and values while we appreciate your differences” kind of thing. Its hard to pin down the finer points of the pre ice hockey immigration ceremony, but coming from a country struggling with immigration issues (Australia), it was wonderful to see it handled so graciously, Australian sport could learn a lot from the Canadians. Thank you Canada. Like the Governator says, “we’ll be back”! Thanks Linda, what a terrific country you have there – so beautiful and all those mountains – wow! We had such a great time. Love me a bit of pattern making experimentation! Thank you! I’m on the west coast where there are lots of mountains. I’m always grumpy if I go to central Canada, as I miss my mountains! I’m going to save your tip on pants construction just in case I need it someday. Nice work. I love the leg length and cuffs too. Thanks luv, always good to push the limits and expose a flash of beguiling ankle eh?! Any Victorians following will be wild with lust! Just moved from there; I know what you mean!!! Haha ! A clip around the ear is the perfect accompaniment!! Lesley why is everything you make so darn cool!? Now I have to make some. Seriously. Yes would be so good for my trip to Italy. There’s actually a pattern in last month’s Burda that I liked, with a sash, as I am not clever enough to draft my own. Sorry to hear about the plantar fasciitis. I had it when I was running but got rid of it fit quickly with a diluted injection of cortisone at the heel attachment point. Every now and then I feel a slight niggles but ran a number of marathons afterwards. I also find sneakers like those hard on my feet after a day of walking. Nice story about the game though you could have been less diplomatic about the girls and skimpy outfits! On immigration I am generally proud of how we handle it (though there are issues here too, but nice to have buy in from the majority and now a Somali born Minister) though the system will be tested on the refugee front now that illigal crossings from the southern border are expanding exponentially and it is still winter. The future is going to be one of huge human flows around the globe and so we had all better prepare for it. Sorry for phone typos. I seriously want those pants…now! Forgot to say I love your hair cut too! Why thanks luv, always looks great moments before it’s due for a cut!! Sod’s law ! Haha, me too! I’m imagining another pair in silk?! Well you are cool. Great minds have made a similar argument about Europe and economic migrants. Re PF I would go to the best sports doctor you can find. AIS? I got lucky as I had an intelligent doctor in Vancouver and together we figured it out. I used to tape my arch when running and found that keeping my calf muscles loose/massaged really helped to take the strain off the foot. Re the cortisone: There was a literature stating that such injections could cause rupture of the fascia in some cases but we went with something like a quarter dose. I remember though that it was quasi miraculous as initially it felt weird, like crystals were forming in my foot, but within a couple of days the inflammation was gone. I also used to massage the parts of my foot that were not injured; rule if thumb to never poke and prod anywhere with inflammation. Also, I always walked barefoot at home, which goes counter to advice but helped my foot to strengthen. Good idea, I’m going to ring the sports physician I see now! I like your other suggestions too. We should start a blog on PF!! Another hail from Canada 🙂 I too am happy to read you had a lovely time and what a kind tribute you’ve made here to it 🙂 I love your pants actually and they’ve inspired me to take yet ANOTHER gander at Melissa’s new pants at McCalls M7445. I just wasn’t convinced that very loose fitting shorter pants would look okay on me but seeing yours has inspired me 🙂 I like the cuffs on yours though and I think adding that bit of weight to the bottom will keep the silhouette properly aligned. I’m new to pants making so forging my own from scratch is WAY above my skill level 🙂 but I will remember what you said about extending the crotch by 1 – 2 cm. when I do make them. Lovely to hear from you Canadian Kathleen 😉 if the pants are already drafted as a loose fit the designer has possibly already accounted for a looser crotch curve, you’ll identify that in a toile most likely. I had problems with the deep cuff getting caught on things, after re sewing at the vertical seams 2 times, I decided if they needed a 3rd I’d have to sew right around the circumference. Saw a skirt on a very fashionable lady the other day and her hem was about 20cm, it made the skirt. So even a very deep hem might do the trick without the hassles of the cuff – but it is lined w Liberty and very pretty when it flashes!! Hey, good luck with your make. Any foot problem is rotten – how else are you going to get round other than on them for Pete’s sake? I agree with the last comment. A clip round the ear sounds well deserved. Your trousers look great. The extra space is essential in this style. 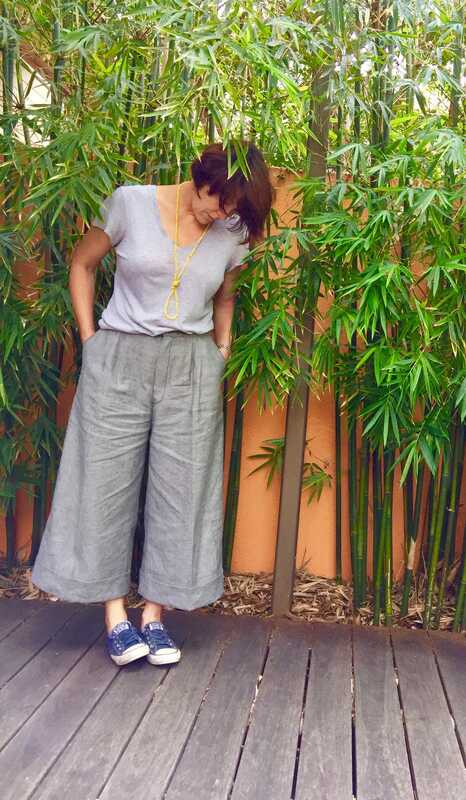 I’m contemplating some cropped pants myself for this summer (optimist in action – UK summer. Huh!). I tried walking on my hands but got squeaky wrists!! It really effects weight gain too. I prefer to stand and walk rather than sit, but find I can’t keep eating the same amount of cream puffs and bickies!! We can definitely send you some summer, I’ll have it packaged and couriered! Hi from the Canadian Prairies and I’m glad you enjoyed your visit! And I hear you about plantar fasciitis. I struggled with that for years after starting to wear Birkenstock shoes on my verrrrry flat feet. But I stuck with the shoes and the discomfort is finally gone. And Birkenstocks are starting to be a little dressier (and less ‘granola’) so I wear them as much as I can. Hi Sox, Birko’s could be a good summer alternative, I just hate being the only kid at school in lace ups!! Funny story, a bus driver was talking to us about the prairies. He said “it’s so flat, when your dog runs away you can watch it for 4 days”!! God we laughed!! Have you got a pants block perhaps? In my last post there were some excellent resources fir making one, might be a good starting point! I don’t make successful dresses – we all have our weaknesses! I love wide legged trousers and these are gorgeous. Embrace the wrinkles – it shows that the fabric is natural. Thanks Sewruth, yes I’ve noticed your penchant for a flowing trew! Thank goodness for natural fibres – this heat, THIS HUMIDITY!! Ah Leslie. Isn’t it incredible what a couple of cm’s do to a trouser crutch?? I recently curved downwards 1cm on the front and back crutch on a favourite block and felt like they were drooping down! Had to quickly fix those. I’d say you cracked it with these they look great. Converse are too flat for me, I discovered the cheap Dunlop rip offs have a thicker softer sole. Comfort and a bit of height for me!! Great you had a lovely trip. Gosh, I so agree Linda. It was just the visual I needed to help me understand the results! Watched a TV ed. of the Edinburgh Fringe Festival last night and vowed to take my husband one day. I’ve been and had a ball. Sneakers are great and thank goodness for the athleisure trend eh? We have marble floors at home and they don”t help at all, hard floors for standing are my nemesis too!